If you’re familiar with the squeaky deliciousness of cheese curds, then you may have also had them served in one or two classic ways. You may have had them deep fried (maybe at home, or maybe at a state fair). Or, you may have had them in poutine, a dish that originated in Quebec and combines French fries, cheese curds and gravy. I had never had them served either way until recently. In fact, I had never heard of eating cheese curds as a snack before I met my husband, who is from Minnesota and says that the fried cheese curds are the best snack at the Minnesota State Fair. We have yet to make it to Minnesota during state fair season, but now that I’ve had Conebella Farm’s fresh cheese curds, I can see how this would be quite the memorable treat. And once I heard about poutine, I was curious to try this guilty pleasure. So, after a trip to Conebella Farm, I came home and started making oven fries. I used a recipe my sister recommended. 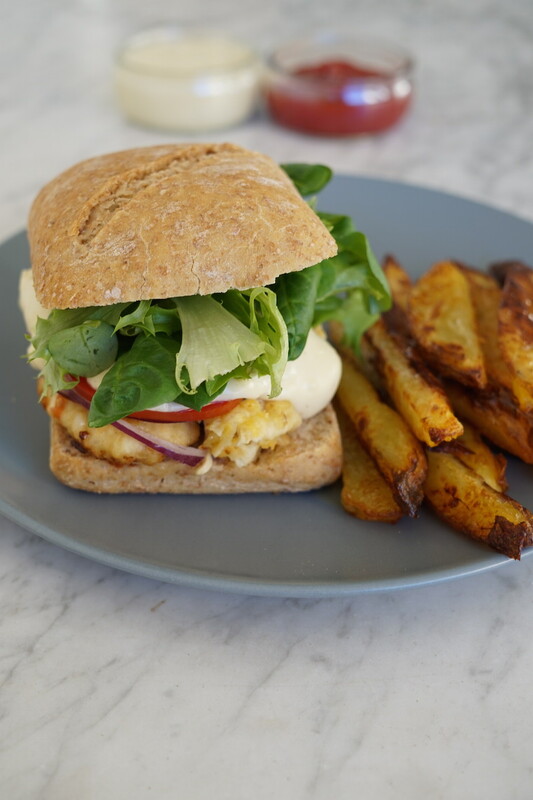 She used these fries as a side for this English pub-style chicken sandwich. Line the baking sheet with parchment paper before putting the olive oil down (for easy clean-up later). After making these, you’ll never buy frozen French fries again. These are super easy and taste like some of the best restaurant fries you’ve ever had. 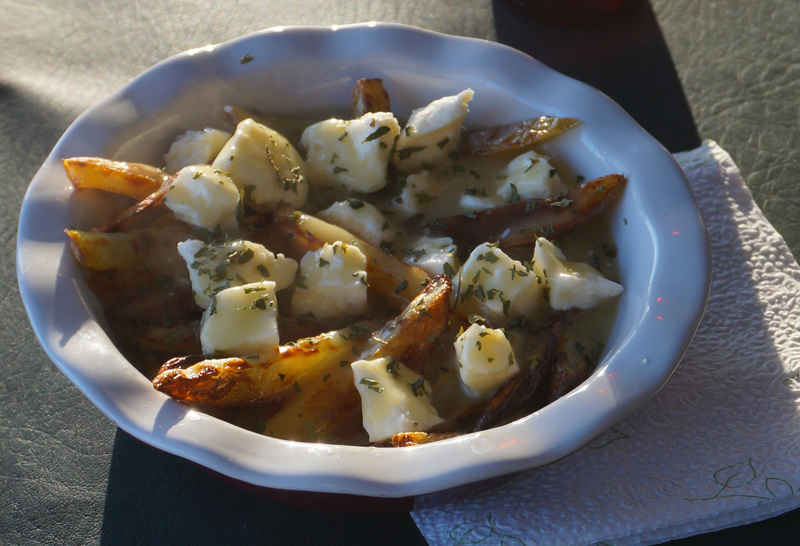 To assemble the poutine, grab a large plate, scatter the hot oven fries, top with cheese curds (you can break them up or use big chunks), and ladle a rich gravy on top. I kept things simple and used a chicken gravy mix I picked up at Weaver’s Orchard, but if you’re feeling ambitious, you can make the gravy yourself with this authentic recipe from a French-Canadian chef. Once the gravy begins to soak into the fries, you can sprinkle some parsley on top (it’s not traditional, but it makes things look pretty! ), and then you’re ready to dig in. When I made this poutine, I offered some to my husband and my parents, but I accidentally forgot to offer them a second taste. It was just so good I kept eating and eating it. Oops. Well, you’ve been forewarned: poutine consumption may lead to a lack of sharing. Did you know you can order poutine with our cheese curds at Station Taproom in Downingtown? When I try making an unfamiliar but classic dish, I often like to try it at a restaurant first to see what it “should” taste like. 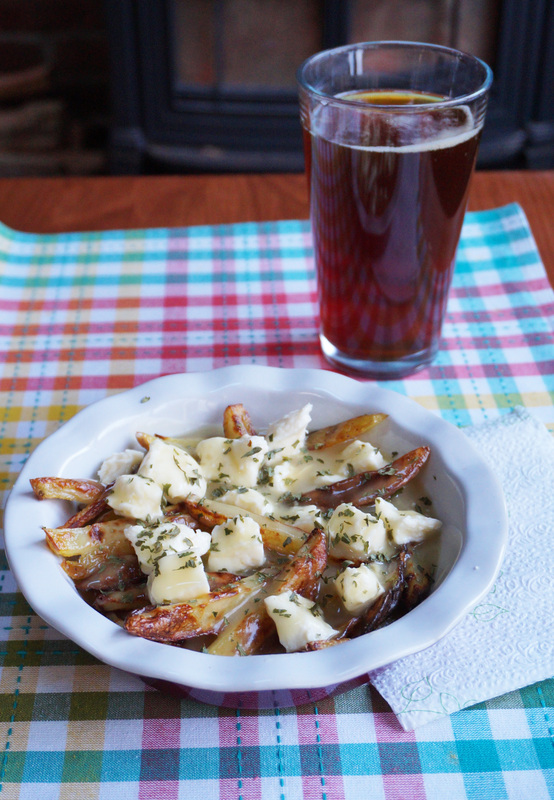 So head to Downingtown and get some poutine inspiration from Station Taproom, and then pick up some Conebella Farm cheese curds and try this at home!